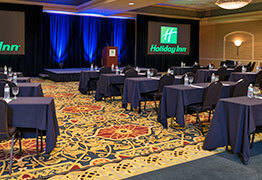 Experience warm hospitality just outside the city at the Holiday Inn South Cleveland-Independence. 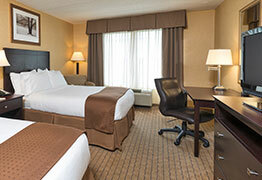 The hotel's prime location in Independence, Ohio puts guests at the crossroads of I-77 and I-480 for easy access to the Cleveland Clinic, Lake Erie, Cleveland Browns Stadium and other exciting attractions in downtown Cleveland. For your next meeting, take advantage of our well-appointed event space and top-notch catering. If you upgrade to an executive-level room, you'll enjoy key access to a lounge with a free continental breakfast, beer, wine and hors d'oeuvres. In addition, our free shuttle goes to Cleveland - Hopkins International Airport (CLE) and other corporations near our hotel's location. Whether you're in Independence, Ohio for business or leisure, you'll love convenient amenities like free high-speed, wireless Internet access. You can unwind in the heated, indoor pool and sauna and dance to live music at Club Impulse. 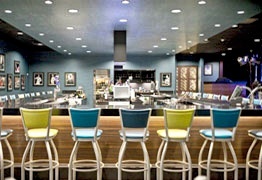 If you're running late, grab coffee and a muffin at the Seattle's Best kiosk in our lobby. Reserve your room today.